"Alice followed the rabbit through the little door and began to fall." 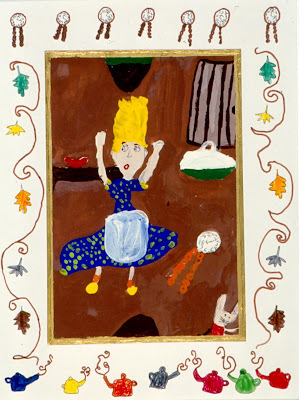 The children paint small paintings in the style of Persian miniatures, illustrating scenes from their favorite books or fairy tales, such as Alice in Wonderland. For ages 6 to 13. Plan 3 to 4 sessions. "Cinderella saw her prince across the room." The paintings in this project deal with the flat design and decorative details of Persian Miniatures. The more elaborate frames around the miniatures in the Medieval illuminated manuscripts called books of hours, are excellent examples to share with the children as they design their own frames. In the 13th century, the Persians created manuscripts illustrated with small miniature paintings, each meticulously done by hand. These manuscripts were held in such respect that only the wealthy could afford them. Illustrating traditional stories and depicting a strong sense of action, they are so detailed we can learn much about the clothing and customs of the time. The people in the paintings and their surroundings are arranged to form a flat, overall design with bright colors and patterns covering the whole surface. The completed paintings were bordered in gold and often given elaborate frames. Gather as many examples of miniatures as possible. Mark a quarter-inch border around the edge of each 7- x 10-inch drawing paper. Cover a piece of paper with paint and let dry. This will be used to demonstrate the process of applying wet paint over dried paint. Set out pencils, papers, paints, medium-sized brushes, containers of water, and sponges. Share with the children the examples of miniatures, pointing out the small size; the full composition; the abundant details and patterns, or decorative designs; and the feeling of action. Explain that the children will be making small paintings similar to the miniatures. Discuss how pictures are used in books to help relate the stories. 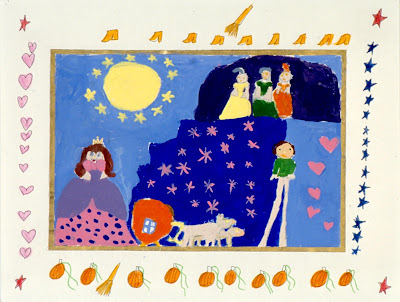 Explain that the children should choose scenes from their favorite fairy tales or books to illustrate as they might be seen in the pages of books. Show the children how wet paint can be applied over dry paint by painting details on the demonstration paper. Explain that this process makes adding details to their paintings easier. For example, it is simpler to paint the whole sky blue and then dab on the stars, than to paint the stars and try to go around each one with the blue paint. When handing out the paper for the children to begin, point out the quarter-inch area marked around the paper. Explain that this area will be covered by a gold border when the paintings are completed and therefore should be left blank. Have the children plan the outlines, or outside edges, of their scenes on their papers with pencils - drawing, for example, the shape of a tree, but not its individual leaves. Explain that after the first layer of paint is applied, any pencil-drawn details will disappear. When the drawings are completed, the children should cover the entire surface of the paper with the appropriate background colors. Set paintings aside to dry. Have examples of miniatures ready to show again. Set out demonstration paper for a more detailed look at applying wet paint over dried paint. Set out dried paintings, paints, and a variety of small brushes. Show the examples of miniatures to the children, pointing out the abundant details and patterns. Demonstrate again how to apply wet paint over dried paint. Warn the children to be sure the first layer of paint is dry before beginning. They should refill their brush with paint often and avoid rubbing with the brush so as not to re-wet the already dry paint. When rinsing their brush between colors, they must dry it very well before getting a new color. Hand out the dried paintings and let the children use a variety of small brushes to fill their compositions with lots of details and patterns. Note: If time permits, an extra session to continue with details and patterns will add a lot to the final results. When paintings are dry, fill in the quarter-inch border with a gold marker. Draw a 7- x 10-inch box in the center of each 10- x 13-inch paper. This is where the finished miniature will be glued. It helps to lightly mark an “x” inside the box to remind the children that the drawing is to be done around the outside edge of the box. Collect examples of the elaborate frames around miniatures. Set out papers, dried paintings, pencils, permanent markers, and watercolor markers. Show examples of frames around miniatures. Emphasize how the designs on the frames relate to the paintings in both color and content. 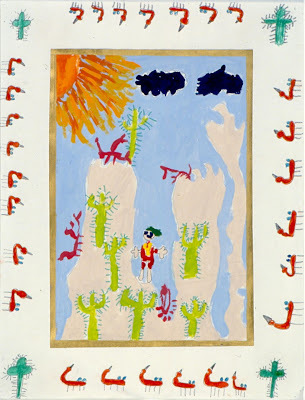 Explain to the children that they will be making their own frames for their paintings. The box in the center of their paper is where their painting will be glued, so they should not draw inside of it. They should draw only on the outside border which will frame their painting. Using items which relate to their story, such as teapots and watches for Alice in Wonderland, the children should plan a pattern to be used around the outside margin of the paper. It is important that the colors and shapes used in the border relate to colors and shapes in the painting. Plans can be made with pencil, but the final drawings should be in black waterproof marker and colored in with watercolor markers. It’s best to keep the background color on the borders white so as not to overpower the paintings. Note: The paintings can be glued to the completed frames using a glue stick. It is important to actually show the children the process of applying wet paint over dried paint. Some children are very skeptical that this will work. Although some miniature paintings are very small, a young child's motor skills are more suited to a slightly larger paper. It’s best if children lay out their compositions loosely with pencils before starting to paint. It’s difficult for them to not draw details with the pencil, so keep reminding them that the details come later and that the paint will only cover over the pencil lines. When working on the frames, the lighter colored watercolor markers allow the details drawn by the black markers to show better. The miniatures become more complete with the individually designed frames. If time permits, have the children write a relevant caption from their story and place it below the frame. Is the surface filled with details and patterns? What can we tell about the characters in the story? Where do you see action in the picture? I forgot to paint my sky blue before I painted on all my stars. I painted my details too soon and now the paint is running together. How do I make green leaves show up on my green tree? If you already painted your stars, try painting around them carefully. If some get covered up by the sky color, you can repaint the stars when the paint dries. If you made a mistake, let that area of your painting dry while you work on another part of your painting. Then you can go back and continue with your details on the dried paint. To make green show up on green, make lighter shades of green (by mixing green with white or yellow) or darker shades of green (by mixing green with blue or black). "The tourist was surprised to find himself surrounded by deadly scorpions."